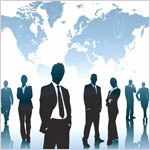 Rathi Personnel Training And Placement Services Pvt. Ltd. is reckoned as a one stop solution provider when it comes to HR services in Panipat, Haryana. We are a prominent HR & Placement company offering top of the line Placement and Recruitment Services to diverse corporate of all sizes with varied business interests. We are well-known for providing an array of services like Training & Development, Placement Services, Overseas Placement, Manpower Recruitment, Human Resource Consultant and Staffing Solutions. As well, we also provide Security Guard Services in Delhi. These services are for various industries like BFSI, BPO/ IT/ ITES, Human Resource, Engineering etc. Our company â��is committed to provide HR services by meeting all requirements of clients through constant monitoring of client feedback, indentify opportunities for improvements and continually improving reliability level of in-house processes. Thus, we are a sole name to approach for all kinds of HR Requirements in Haryana. We were established in the year 2005 under the mentorship of Mr. Ompal Rathi, who is the current CEO of the company. This man, with his great passion and dedication, has paved a way for the success of the company. Today, we are backed by professionals that bring goodwill to Rathi Personnel Training And Placement Services Pvt. Ltd. Our specialization in identifying right people for the right job has set us apart from the rest which counts for the name and fame of the company. We work in synergy with clients to understand varied requirements and procure best results for them. One of our many attributes is that we meet staffing needs in a very short time. Our mission is to be the most valuable Human Resource Solution provider by achieving performance at par with the best. In pursuance of accomplishing this objective, we will continually improve our process, build our systems and upgrade technology. Rathi Personnel Training & Placement Service Pvt. Ltd. (RPTPS) is a professional security company operating from our central head office in ROHTAK (HARYANA). Currently our security operations cover all over the India and in future we trying for other countries. Management Support Services and much more. With 8 years of experience in the industry, we have achieved a major success in the HR industry. A renowned name as Labour Contractor in Delhi, today we are listed among the top notch service providers that understand local and international businesses in the most efficient way. Maintaining a healthy partnership with our clients, we help them with every possible solution so as to see them grow. We work in synergy with clients to understand varied requirements and procure best results for them. One of our many attributes is that we meet staffing needs in a very short time. No wonder, we are all set to be counted amid the prominent names as Labor Contractor in India.